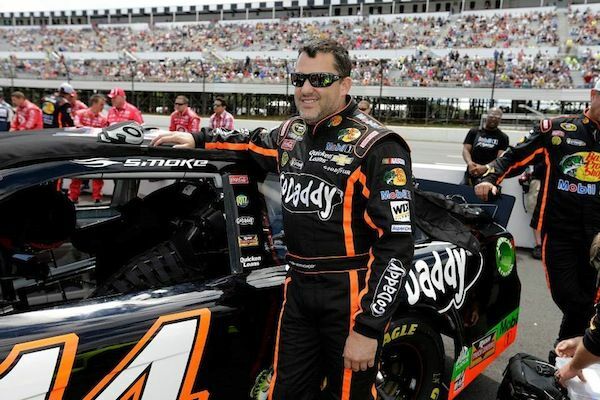 Three-time NASCAR Sprint Cup Series champion Tony Stewart suffered a broken leg and had surgery last night following a sprint car crash at Southern Iowa Speedway. The 42-year-old Stewart was involved in a four-car pile up at the Front Row Challenge sprint car event, which resulted in a broken right tibia and fibula. According to The Des Moines Register, Stewart was leading the 30-lap race with five laps remaining when another driver spun on Turn 4 and collected Stewart, along with two other drivers. Stewart was immediately rushed to a local hospital for surgery following the accident. Track officials report that Stewart was conscious and talking following the crash. The wreck occured one day after Stewart’s ninth-place finish in the NASCAR race at Pocono Raceway. Stewart is 11th in the Sprint Cup standings, and sits the first wild card position. As a result of the injury, Stewart will miss this weekend’s road course race at Watkins Glen, which he has won five times. Stewart-Haas Racing has not named Stewart’s replacement. Monday’s crash marks the third time Stewart has wrecked in non-Sprint Cup races since July. In fact, Stewart was involved in a violent sprint car crash last Monday in Canada. Luckily for Stewart, he was left unharmed after his car rolled five times during a race at Ohsweken Speedway, Ontario, Canada. In July, Stewart triggered a 15-car wreck at a race at Canandaigua Motorsports Park in Canandaigua, New York, which sent two drivers to the hospital with injuries. Stewart was not injured in the crash. Jason Leffler died from injuries sustained during a 410 sprint car race at Bridgeport Speedway in Bridgeport, N.J. Leffler, 37, was in second place with a few laps left when his car suffered a front suspension failure, causing him to crash into a wall and flip multiple times. The cause of death was blunt force neck trauma. Veteran sprint car driver Kramer Williamson died last Sunday from injuries during a qualifying race at Lincoln Speedway in Abbottstown, Pa. The 63-year-old Williamson was on the fourth lap of a 10-lap qualifying race when his car climbed atop another car and crash into a retaining wall. Williamson’s car then climbed a fence before crashing back down on the track and flipping several times. Williamson was inducted into the National Sprint Car Hall of Fame in 2008.